The B&M Shift Improver Kit is the easiest way to get the stout performance you've always wanted out of your automatic transmission - and you get two modes of performance to select from: Heavy Duty, or Street/Strip. It's B&M's least expensive and simplest to install kit. All you need are a few dollars and some hand tools! In the space of an afternoon, you can turn your transmission into a B&M-tuned unit! Just ask the thousands of satisified customers that have installed one in their transmissions! Firm positive shifts without loss of driver comfort for improved performance in all street vehicles. Recommended for regular passenger vehicles. Provides very positive shifts for high performance street use or for competitive events. This model is for the enthusiast who wants the hardest, quickest possible shift. Provides crisp shifts on any stock automatic transmissions. Elimination of soft sluggish shifts, shift overlap, and excess wear on clutches and bands due to slippage. 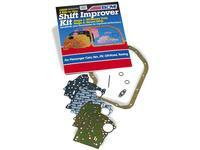 B&M Shift Improver kit for the 88-94 Turbo-Hydro 400 (3L80) 3-Speed automatic transmission. B&M Shift Improver kit for the 68-81 TH350, TH375B, and M38. Not for the TH350C use B&M TransPak# 30235 for the TH350C applications. B&M Shift Improver kit for the 81-90 Turbo-Hydro 200-4R 4-Speed Automatic transmission. B&M Shift Improver kit for the 82-93 Turbo-Hydro 700-R4 4-Speed Automatic transmission.